One thing we’ve seen happen as a result of our efforts at Freedom Alliance was perhaps a side effect of the expression of gratitude, and yet we have come to see how important it is. That thing is stronger relationships. When a married service member receives attention from our organization—whether that is a grant, a vacation, enrollment in Presents for Patriots, or a track chair donation—his or her marriage is somehow bolstered along with the support. It’s become something that Freedom Alliance likes to encourage, because a more durable marriage will carry a couple through many hardships—hardships that are an inevitable part of a combat veteran’s journey. We saw an opportunity this year to support military couples during the Valentine’s Day weekend and jumped on it. And in the process we found the most charming romantic getaway: the Essex Inn in Tappahannock, Virginia. A historical bed and breakfast, nestled in a sleepy little river town, steps away from the banks of the Rappahannock, the Essex Inn is the perfect setting for escape and comfort. The innkeepers, Jeremy and Ric, made special arrangements for our guests, decking the bedrooms with roses and treats and setting the tables for dinner to keep romance in mind. We also put out boxes of Lisa Hoffman scented oils, and children from the local elementary school contributed notes of gratitude. 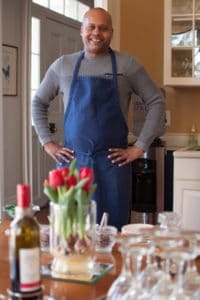 Upon arrival Friday evening, the guests were offered a wine-tasting from JWSieg Wines of Charlottesville, Virginia, which was followed by a Southern-style dinner of homemade fried chicken, venison ribs, macaroni and cheese, and rice pudding. The next day, Ric prepared a delicious breakfast spread, while outside there was a fleeting snowfall. After lunch, a masseuse arrived with champagne and strawberries and couples’ massages in the rooms. 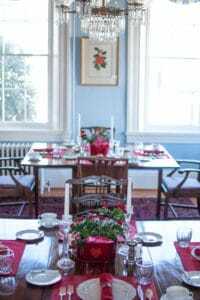 Later that afternoon, a local musician entertained in the parlor while the guests sipped the inn’s very own wassail. Eight-year-old Addie from Richmond recited a patriotic poem and gave out boxes of chocolates, and the evening was capped by a wonderful surf-and-turf dinner. The final perk of the weekend happened when local photographer Dawn Howeth, of Picture This by Dawn, came to shoot a couples’ session, creating a personal remembrance of the weekend for each family. We hosted four couples for the romantic getaway. Matt and Bonnie drove from North Carolina, where they live near Fort Bragg. Matt served in the Air Force, but he’s had to cope with a hip replacement and constant pain as a result of injuries. Jeramie and Lindsey were happy to be celebrating Jeramie’s second “Alive Day” anniversary. On February 13, 2012, the veteran was in Afghanistan, two days from coming home, when he chased down a runaway truck headed for a fuel pump. He managed to divert the vehicle, saving many lives, but he was inside the cab when the truck tumbled over a steep ledge, resulting in the loss of his right leg. Lieutenant Commander Jae and his wife, Kim, came from Walter Reed National Military Medical Center. Kim is an elementary school principal in Annapolis and Jae is recovering from a leg amputation, a consequence of an explosion while on foot patrol in Afghanistan. Will and Shanelle are also from Walter Reed. Will was deployed to Afghanistan with his engineering brigade; he also lost a leg when he was injured by an explosive. Freedom Alliance gave his father a grant to cover travel expenses in the spring of 2012 so he could visit his son in hospital. Shanelle told us that she liked hearing about the history of the inn, including ghost stories during that blustery Saturday night, when it started to snow and the lights flickered. She said that alone time with her husband was much appreciated, as well as the opportunity to chat with other military couples who share much of the same experiences as they. And, the food was so much enjoyed, Lindsey joked that the husbands should take a few cooking lessons from Ric, the inn’s master chef! 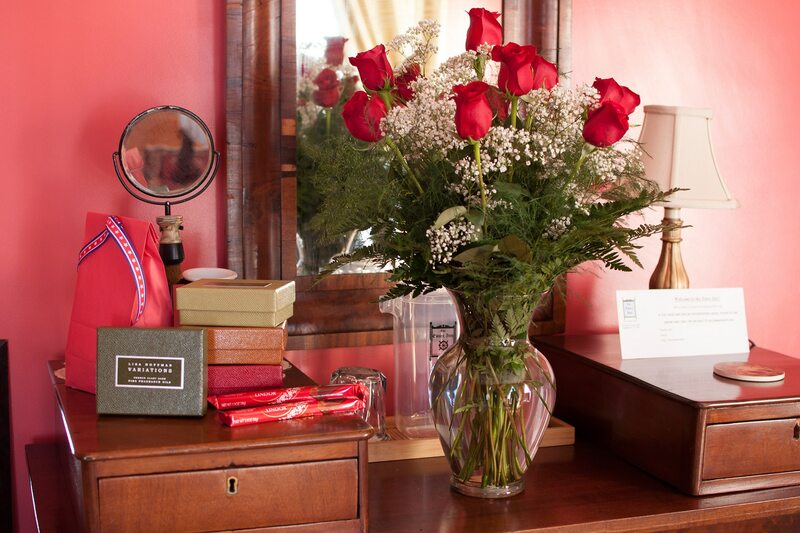 Indeed, there was a lot of love reflected at the Essex Inn this Valentine’s Day. So much so, that we hope to do it all again next year.